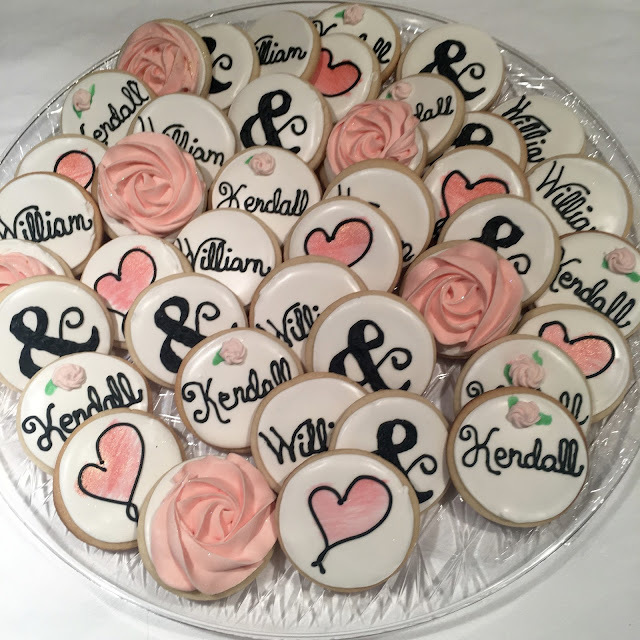 The previous post highlighted some of the more formal cookies for engagements and weddings. These are a sampling of a less formal, but equally delicious, love. They are such fun to make! Ice blue was the request here, and when she forwarded me the invitation, it also had white hydrangeas. They were a nice addition to the blue. I love the font. 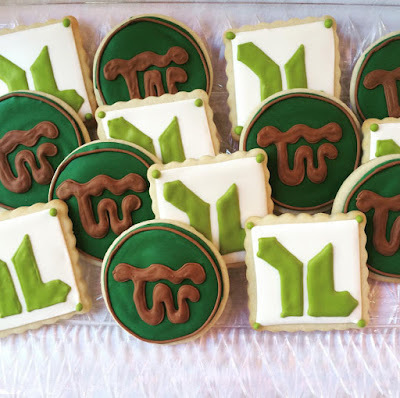 This stick drawing is a favorite of many cookie decorators. And why not? It is adorable. Such a fun platter to make. She requested some bite size which I think is such a good idea with a big gathering. When the canning jar craze hit, I bought the cutter and anxiously awaited the opportunity to make some cookies with it. It took awhile but I really thought they were cute. The hydrangeas made an appearance here, I thought they went well. The texture is a nice addition to a platter. I decided to make some Valentine cookies with the canning jar cutter too, which I may like even more! When my girlfriend asked for shabby chic, I was a little befuddled. I just wasn't sure how I could achieve this. It's hard to see how the painted hearts are a coppery/pink color, but I just loved them. My adorable daughter pointed out that I didn't "stay in the lines" which was kind of the shabby point. They were just different, and I think that's what they wanted. Non traditional. Unconventional perhaps, but lovely none the less. So, what are you waiting for? Get in there and bake! Lots of engagements and weddings. Perfect celebrations for cookies. 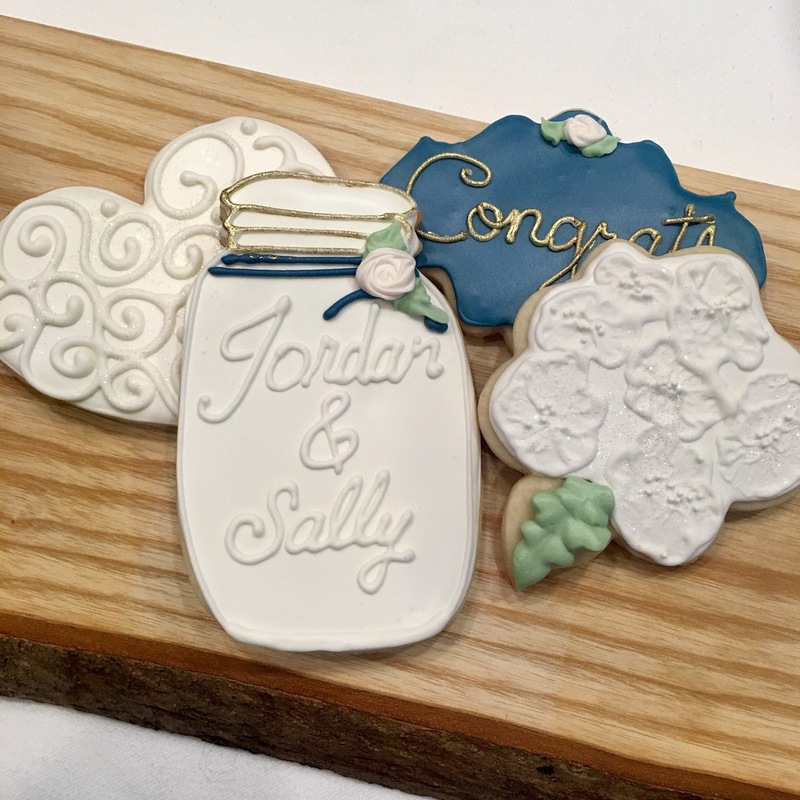 Either as favors for a wedding or shower, beautiful platters for an engagement, a little happy for the couple for a smaller get together. I love them all. 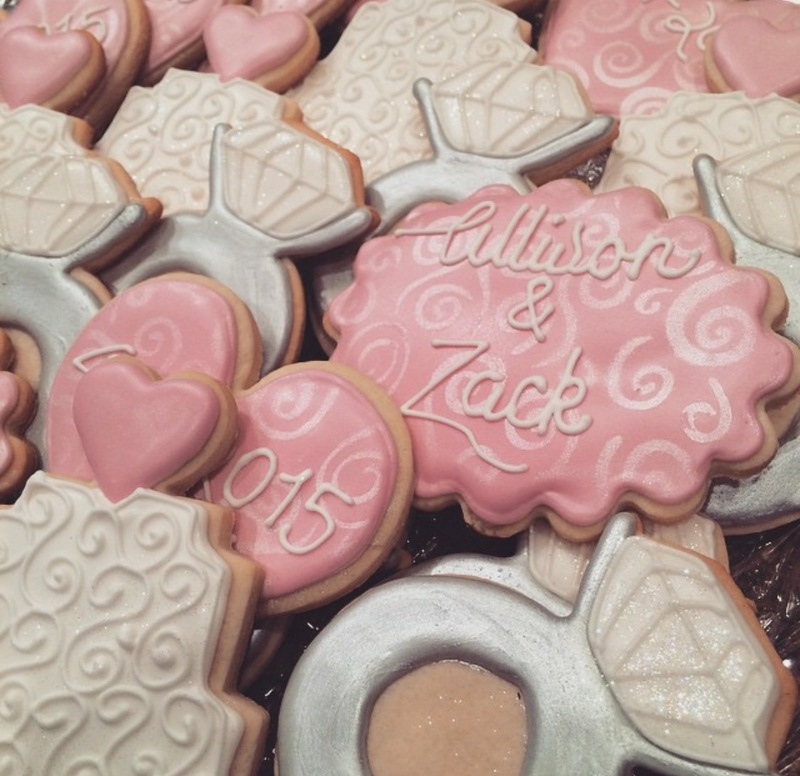 Monograms, the date, the rings, the cakes...so many ideas to put on a platter! And the colors! These are the more formal. The ampersand has made a big comeback. I do love it, however the ampersand cutter I invested in was a bust. Very fragile and almost lost its shape. The ampersand in icing seems to work well. This grey and lavender shower was different for me. I like the subtle colors for fall. I love the rose pink color with the silver, such a classic combination. The pearl airbrush really popped in this picture, but truthfully it is very subtle. These cookies were special for me to make. This was for my son Nic and Madison's engagement. I would never have believed how fast that year passed from engagement to wedding!!! The champagne bottles were made with edible paper labels. I just love them, they make such a statement. The gold roses were not my favorite. 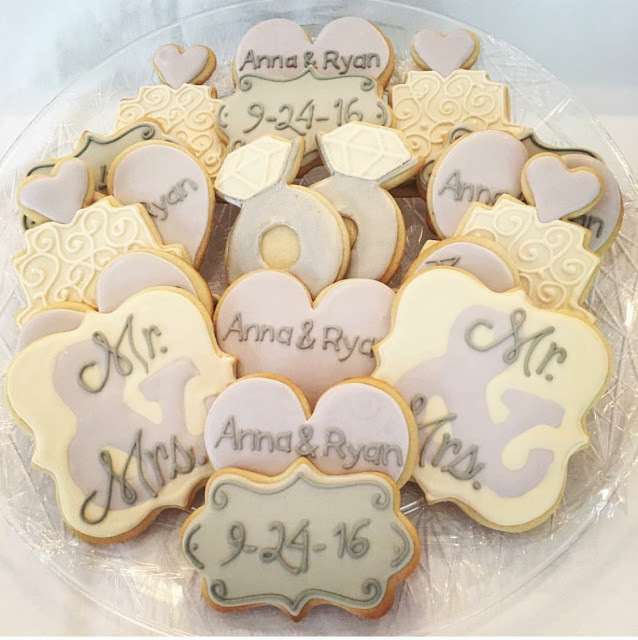 These wedding cookies have a more formal flair, I think it is the addition of the black tie cookies. I just love that pop of black on the platter! The rose cookies add a lot of depth to the platter and I use them quite a bit. They are a nice eating size and really stunning to look at. The small roses are something I always (ALWAYS) have on hand. Takes a simple plaque to something special for sure. This platter is a much more subtle pink, and it was gorgeous. All the usual suspects on the platter plus some wonky roses ala Sugarbelle and that ampersand cutter I don't love. So just a sampling of the wedding fever. What are you waiting for? Get in there and bake! Doctors, Dentists and Nurses are a common theme for cookies. I do a lot of graduations and milestones. It's especially fun when it's a family member, such smart children and their amazing careers. 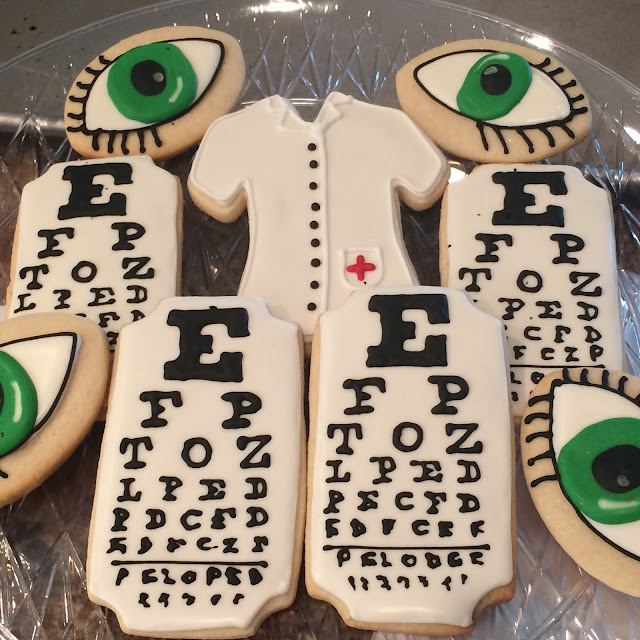 These were made for my dentist office and they sent them to some referring doctors. I am not a fan of the dentist, but I do love mine. I especially love not having to go back for anything after the cleaning! These cookies were for our friend's daughters. Two, graduating together from medical school. One in Pediatrics, the other, Obstetrics. Talk about an over achieving family! Was so happy to be a part of the celebration. And these were for my niece and her fiancé (now hubby) when they graduated from Medical school. She is a Pediatrician and he is an Urologist. Wow! These were for an Optometry practice that Christina worked at following college. They eyeballs!!! One of the many nurse platters I have made. My grandma was a nurse, huge respect for this career choice! This nurse is at a Memphis institution, LeBonheur Children's Hospital. Awesome. Lots of fun things...career day cookies galore. So, what are you waiting for? Get in there and bake! 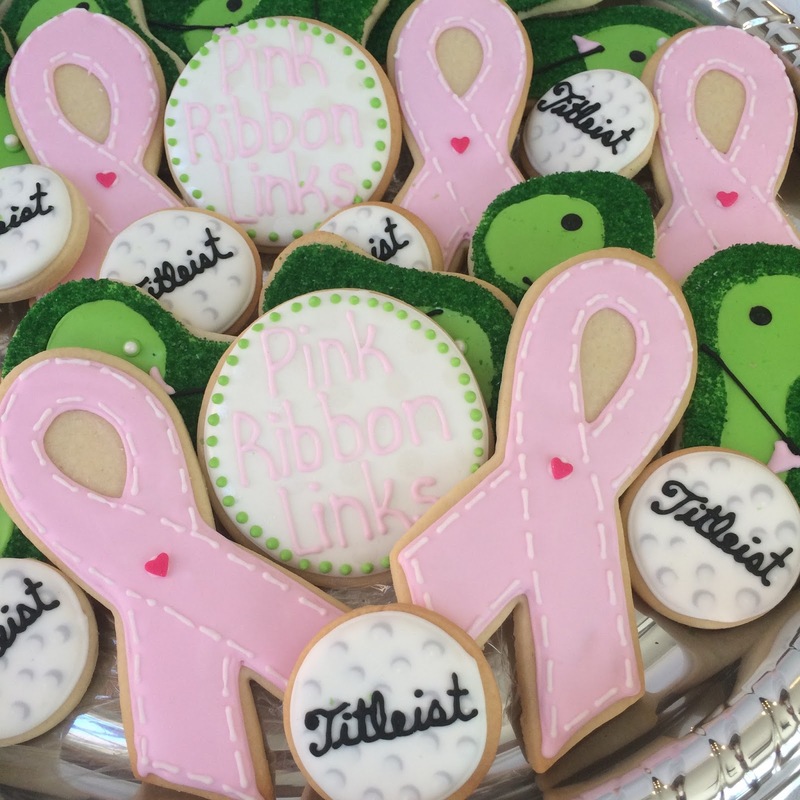 Very often I am asked to make cookies for a cause. Sometimes it's for a hospital, a researcher, or a cause like breast cancer. I do plenty of donations monetarily, but I rarely do cookie donations. It can take days to put together a large order. Honestly, Id rather write a check, I believe money goes a longer ways than cookies! These were for a researcher in a breast cancer organization who is also a Hobbit fan! When people think of Memphis, St. Jude Children's Research Hospital is usually what they think of. The fact is we have another amazing children's hospital, LeBonheur. And their logo is the sweetest. Germantown has a charity horse show every year that is steeped in tradition. I made these for a friend when her daughter was on the court for this event. She is also a jumper, and wow...that is something to see! I made these for some kids when they came home for a break from their Young Life camp. It sounds like an amazing organization. Finally these were made for the Pink Ribbon tournaments. Silent auction items. I usually put in a platter of fall cookies as well in case someone just wants some for entertaining.